At the same time that major bank CEOs were being questioned by Congress yesterday about their exorbitant pay packages, one of America’s highest paid bank CEOs was likely just having a normal day at the office. 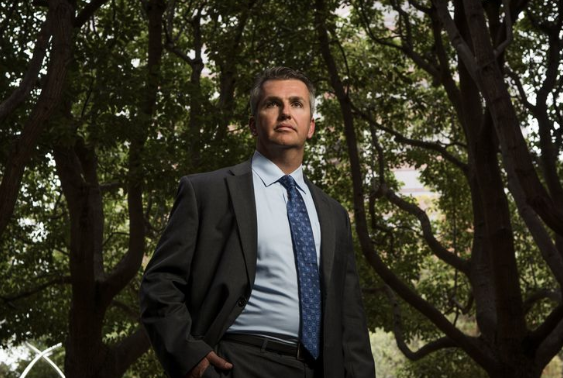 Gregory Garrabrants is the head of Axos Financial (formerly the "Bank of Internet" / BOFI), an online lender, who earned a massive $34.5 million in compensation in 2018, eclipsing the sums made by CEOs like David Solomon at Goldman Sachs and Jamie Dimon at JP Morgan. 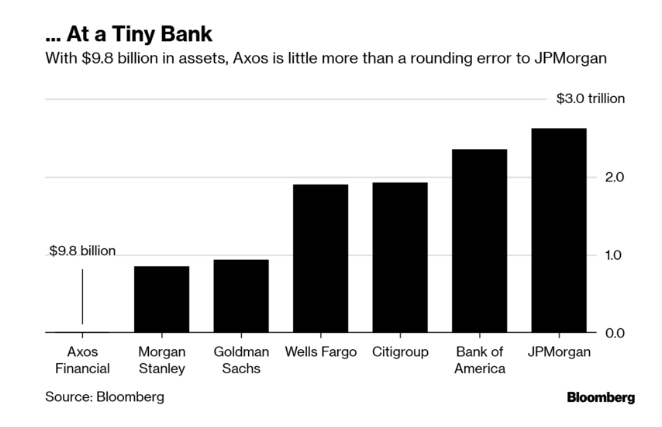 What makes the pay package stand out even more is the fact that Axos is only a $9.8 billion bank, compared to JP Morgan, which has assets approaching $3 trillion, according to Bloomberg. Garrabrants' massive compensation comes as a result of the bank's complex pay structure, which has been a point of debate surrounding the company. Some believe his pay is fair for a CEO who has overseen a substantial rise in share price, while others believe that it encourages short term incentives and that it is indicative of a board that’s beholden to its CEO. Axos' stock price was up 72% last year, but nearly half of its shareholders voted against its CEO's compensation plan. ...if a company worth $100 million doubled in value and the index also doubled, the CEO gets nothing. If the index stayed flat, however, the CEO gets 2 percent of the entire $100 million increase in market cap, which in this case equals $2 million. The bank struck a new contract in 2017 that helped lead to the huge payday in 2018 for the CEO. The company's chairman, Paul Grinberg, stood up for the compensation plan, saying that it aligns the interest of the company's CEO with the bank's shareholders over the long-term. He claims that the payout should be looked at "over the life of the plan" rather than over any single year. He also pointed to the company’s stock performance. Since Garrabrants started as CEO, shares have returned nearly 1700%, far surpassing the 166% gain for small caps and the 65% gain for an index of community and regional banks. The 47-year-old CEO has formerly worked for Goldman, McKinsey & Co. and mortgage originator IndyMac Bancorp Inc.. He has run Axos now for over a decade. Assets under his management have increased tenfold, partly as a result of providing esoteric loans that some other banks have avoided. But Axos has been under consistent scrutiny. For instance, in 2015, a former internal auditor at the bank accused it of compliance failures and improper related party dealings, which drew the attention of short-sellers and sparked several lawsuits. The SEC looked into the bank's internal controls and loans to foreigners in 2015 and concluded a probe in 2017 without taking action. The compensation plan has raised numerous red flags and Glass Lewis & Co. and ISS, who advises shareholders on how to vote at annual meetings, said that it could result in astronomical pay after single year of big gains, which is exactly what happened. Keefe, Bruyette & Woods’ Michael Perito called Garrabrants' pay figure "bizarre" relative to the size of the bank. 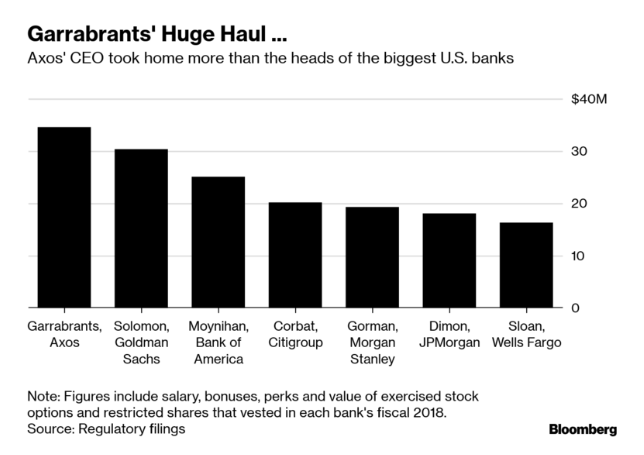 The bank's closest rivals took home only a fraction of what he took home and if Jamie Dimon's pay was structured the same way relative to the S&P 500 financials index, he would have made about $400 million over the past year. “It was a direct result of a new compensation plan and dramatic share performance, which was almost a little artificial,” Perito said, alluding to a short squeeze in the company's stock price. In the first year of the CEO's new contract, which runs on a fiscal year ending in June, the stock was up 72% versus the 11% for the benchmark. Based on the company's market value increase, Garrabrants was awarded $32.3 million in shares and performance units in addition to his $700,000 salary and $1.42 million bonus. His total haul is nearly twice what Jamie Dimon’s take-home pay was last year. When asked about the pay plan, some of the largest shareholders of the company were surprised, including Don Hankey, who owns almost 6% of the company.